Pictured is the Columbia High School girls soccer team after defeating Althoff on Saturday to win the Nike Bracket of this year’s Metro Cup tournament. 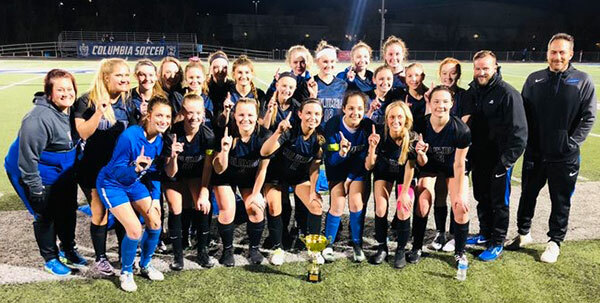 The Columbia High School girls soccer team avenged last year’s loss in the sectional final by downing Althoff, 2-0, at home on Saturday to win the Nike Bracket of the Metro Cup. Haley Glover and Kennedy Jones each scored goals for the Eagles, who improved to 4-0 on the season. Columbia opened its season with a 3-1 win over Triad last Monday, which was followed up by a 4-0 blanking of Springfield last Tuesday and a 3-1 victory over Edwardsville on Thursday. Glover and Chloe Graff have each scored five goals on the season to lead the Eagles in the early going. In other Metro Cup action, Gibault (2-2) lost in penalty kicks to Mascoutah on Friday, 2-1, but defeated Mater Dei on Saturday, 1-0, to conclude tourney play. The Hawks opened Metro Cup play with a 1-0 loss to Rochester last Monday before edging Highland, 1-0, last Tuesday. Gibault plays at Columbia at 6 p.m. Thursday. Waterloo (2-1-1) edged Edwardsville, 1-0, on Saturday to end Metro Cup play on a high note. The Bulldogs opened Metro Cup play with a 2-0 loss to Althoff last Monday. 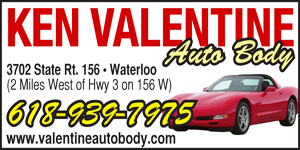 Last Tuesday, Waterloo tied Belleville West, 1-1. On Thursday, the Bulldogs blasted Marquette, 4-1. Payton Richter, a freshman, leads Waterloo in scoring so far this season with three goals and an assist. Waterloo plays at Columbia at 6:30 p.m. Monday.